Throughout the world, there are many communities with honest, hard-working people who live without adequate shelter, clothing, and/or food because of economic oppression, social turmoil, or any number of causes outside of their control. Many people begin life at a great disadvantage merely because of where they were born. Even if capable leaders desire to improve the quality of life for the people in their communities, they often lack the resources to implement any plan of action. In many cases, they have no connections with those who have resources and little hope for improvement. Sadly, when these struggles continue generation after generation, eventually people may become conditioned to assume that life is about survival, and they lose their ability to dream of a better future. Efforts to attain even a modicum of prosperity and comfort so often are thwarted by political, social and environmental factors that it becomes conventional wisdom to abandon this pursuit. Because of a lack of opportunity, people become de-motivated over time. Its not laziness; its hopelessness. Such communities need to be energized and revitalized. The question then becomes, how do we cultivate the necessary change in underdeveloped communities? The world is changing constantly whether we intend it to or not, but our goal is to strategically foster long term positive change. We call this kind of change sustainable change. 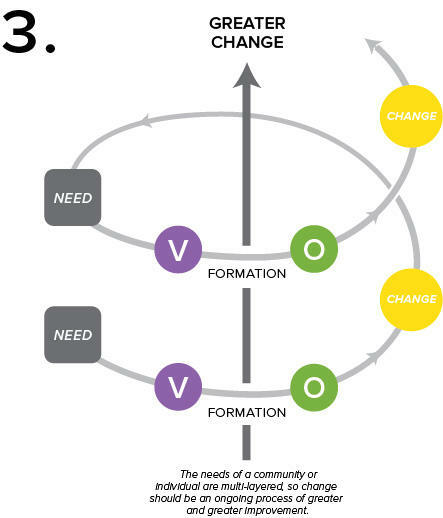 The EM Model for Sustainable Change has three stages and suggests that sustainable change in the life of a community or individual is precipitated by two primary catalysts: RELATIONSHIPS and RESOURCES. EM seeks to be an agent of change by achieving long-term sustainable impact in underdeveloped communities. This is when transformations really occur. While poverty is the most obvious problem, unfortunately money alone is not the answer. The most fundamental needs are to inspire VISION and create OPPORTUNITY. These empower people to pursue change. Sustainable change develops out of a vision, and it is our conviction that this should not be imposed by an outside party but rather it should come from within the community. This safeguards the dignity of the people in the community by allowing them to shape their own future, and it encourages the community to take ownership of the work that is done. The first step is creating an environment for healthy relationships and EM believes this can help foster hope which produces internal change. Resources such as supplies, education, money, and time are all important because they provide a means for external change. EM intends to promote sustainable change by inspiring vision and creating opportunity in underdeveloped communities through building relationships and providing resources. 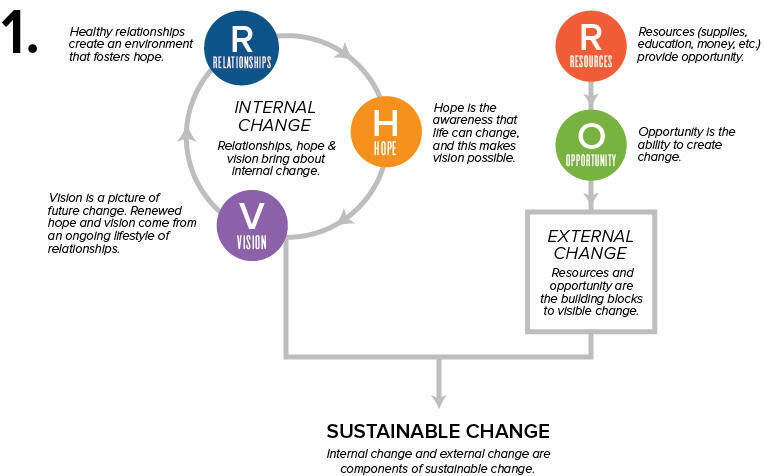 The synthesis of vision and opportunity produces action which creates change, and when there is internal and external change this increases the possibility of sustainable change. How do vision and opportunity create change? To strategically move toward sustainable change, a need must first be identified, and there must be a desire for change. Desire alone is insufficient, for it may be obvious that a need exists, but there must be a goal to provide direction, and this happens when a vision is born in people's minds and hearts. For this vision to become reality, the necessary resources must be present, and this creates an opportunity for action. In this process, both the community and the outside partner have something to offer. 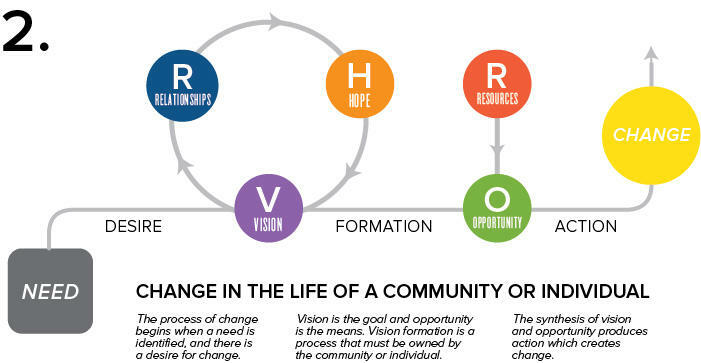 It is essential that the vision is born from within the local community because if the vision is imposed from the outside, the community may not fully embrace it or feel responsible to maintain it; then change is likely temporary. However, when resources are lacking there must be assistance from an outside partner to create the opportunity for the vision to be achieved. It is our intention to partner with underdeveloped communities to provide resources and opportunity while allowing and inspiring the community to form its own vision. Our vision has always been to have a long-term impact in the our partner communities, so it is our hope to be a part of an continuing pattern of progress within each developing community.